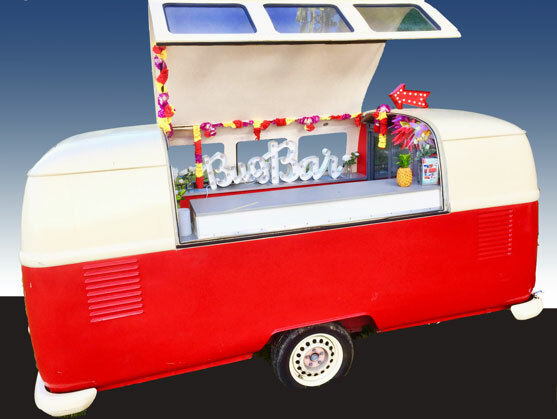 The Bugbar was launched in 2013 and born out of a lifelong love affair with cool camper vans, festivals, great music and first class drinks. The concept was created by entrepreneur, DJ and business owner Justin Rushmore. We have travelled far and wide to deliver our expert services, with 2018 being our most successful season yet. 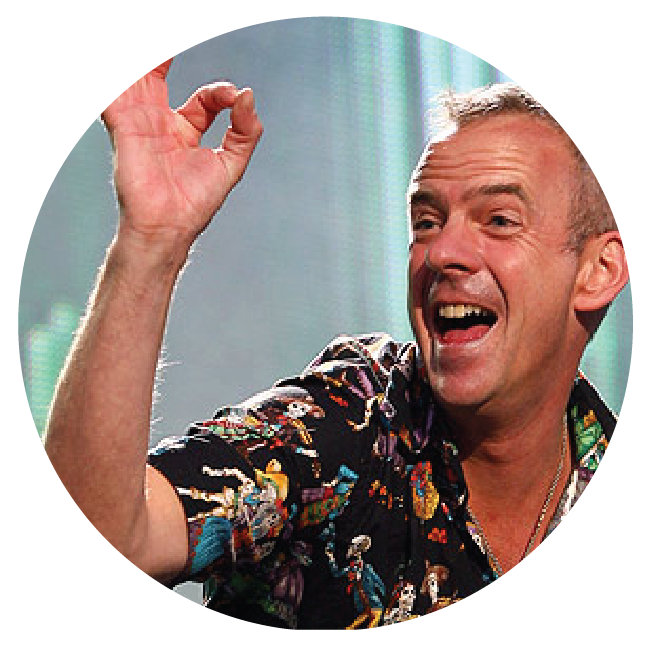 Hosting an event with FatBoy Slim in our hometown of Brighton was a huge highlight. We have also been working with some great brands, including the World Athletics hosted at the Olympic stadium, Next, VW, Amazon, Soho Street Music Festival and the Grove Hotel, an outstanding five star hotel. Each client has used the Bugbar innovatively to create exciting and unique experiences for their guests. We’re proud to have served a whole host of celebrities including Little Mix, Holly Willoughby, Zoe Ball, Gabby Logan, Craig from Strictly even Mark Wahlberg – they all love the Bugbar! 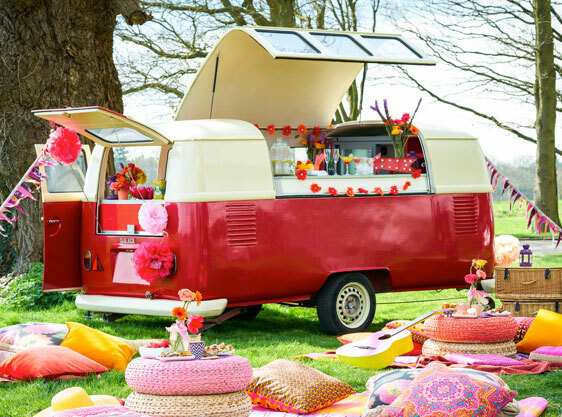 Meet our fleet of converted VW trailers. With a variety of colours and personal features, our Bugs offer something for everyone. Gusto is our awesome dual-purpose bar/DJ booth- Fitted with refrigerating systems and a hydraulic roof, there is plenty of room inside to serve your favourite drinks or DJ! 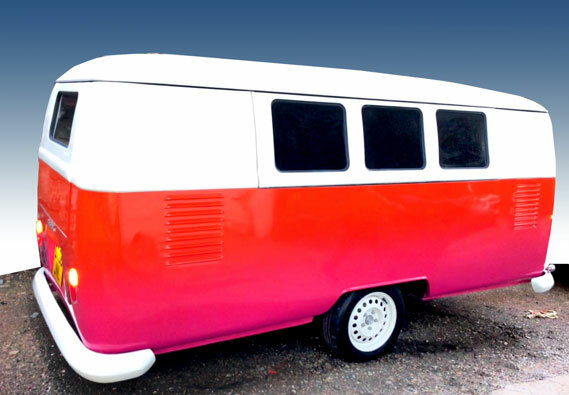 Gusto’s beautiful sunset colour is a hit with those looking for something a little quirky. The Duke is our original bar, born in 2012, and she has seen it all! Her classic red and crème colour makes her most popular with weddings always hitting it off with the guests. Her gorgeous interior, fitted with fridges, a speed rail and elegant décor, makes her a fantastic Bug to serve cocktails from. 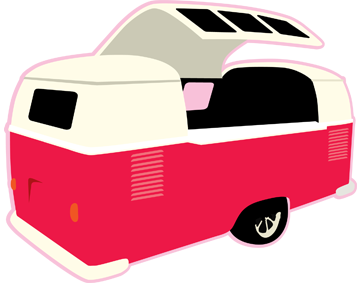 Ellie is our classic deep red & crème VW Bug. Full of character she knows how to impress clients, always bringing class and flair to events. She’s served many famous faces, including Made in Chelsea stars and Norman Cook! What are the dimensions of the Bugbar? All our vans are trailers and have no engines; they are 4.5m L including the tow bar, 3.5m without, 1.85m wide and 1.95 high with the roof down. They weigh approx. 750 kilos and are easy to maneuver due to the central axis. We need flat, firm ground. They can be towed by a van or car. Do you require electricity or water? We are completely self-contained and can work virtually anywhere. We do require a power supply, and come with extension cables, we can run from a single mains supply or a 16amp hook up. If there is no power on site generators can be arranged on request. Access to water is preferred but not essential. 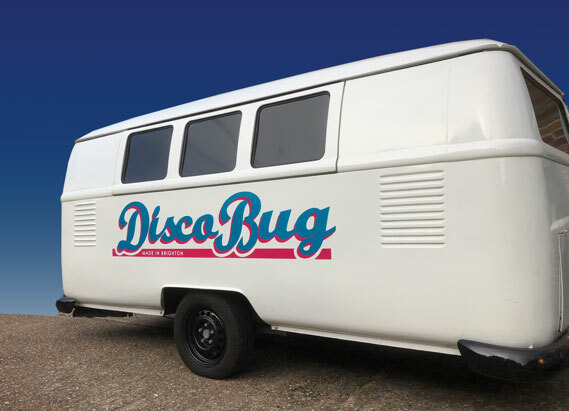 When hiring the DISCOBUG we would require a second power point to drive the sound system. We prefer to operate within a 100-mile radius of Brighton. There is no delivery charge for the first 30 miles round-trip, after which it is calculated at 50p per mile. We have provided our services as far as the South of France, Edinburgh and southeast Cornwall so please feel free to enquire. In order to secure your booking, you will need to pay a deposit of £350. We will send you an invoice and booking confirmation and you can pay by bank transfer. Any outstanding monies or balances are due at least 30 days prior to the event start date. What happens if we need to cancel or change the date? The deposit is non refundable however we understand that occasionally there are valid reasons to amend the booking so please call us to discuss alternative arrangements. Yes, we have full public liability and employers insurance up to £10 million. Please email us if you would like to view a copy. No we do not currently charge VAT. What is your ‘Green’ policy? We care for the environment. We use biodegradable straws and reusable cup ware wherever possible. We recycle glass and dispose of any rubbish at the end of the event. We leave the venue neat and clean as we found it. When we are operating a pay bar option all we ask is that you agree with us in advance what you are planning to supply, for example wine with a meal. We set an agreed minimum spend to reflect this. What sound system and equipment do you use? We use FBT, state of the art sound handmade from Italy…only the best. Ideal for up to 300 people outdoors, although has also be sufficient for up to 1500 people for FatBoy Slim! FBT Ventis 206A and Subline 118SA. Plus technics 1210’s, Pioneer XDJRX controller, other equipment available on request. Yes of course we offer the DISCOBUG with or without DJs. We have a roster of excellent DJs to suit your occasion. With the bar service we typically can serve up to 150/180 guests with one Bugbar. We also have a 5-meter festival bar for larger events. 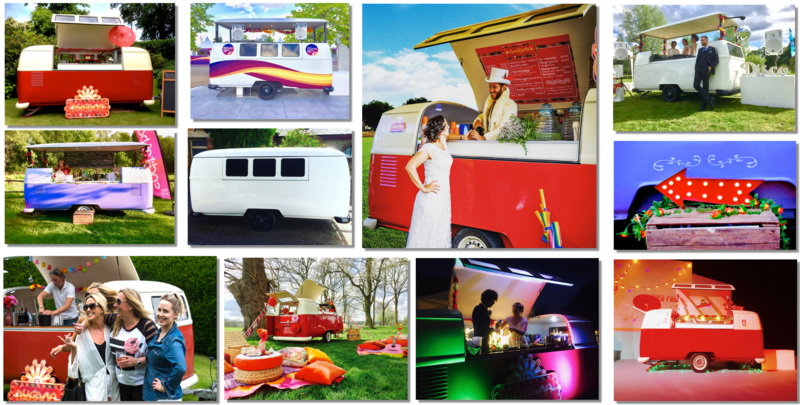 We have serviced events of 3,000+ guests but prefer to work with smaller events. The DISCOBUG has played to crowds of 3000. Which drinks do you serve? We offer a full bar service from craft beers, ales, wine, bubbles, spirits & mixers through to cocktails. We always have a drinks consultation before the event and recommend a choice of 4-5 cocktails. If you have any preferences we will do our utmost to accommodate. Do I need to apply for any licenses? If your event requires a temporary event notice (TEN) for the sale of alcohol, we are able to apply directly for this on your behalf. There may be a small additional fee for this. We use reusable cup ware wherever possible or disposable cup ware, however glassware can be arranged for a small fee. Our prices reflect no more than what you would expect to pay in your local pub. 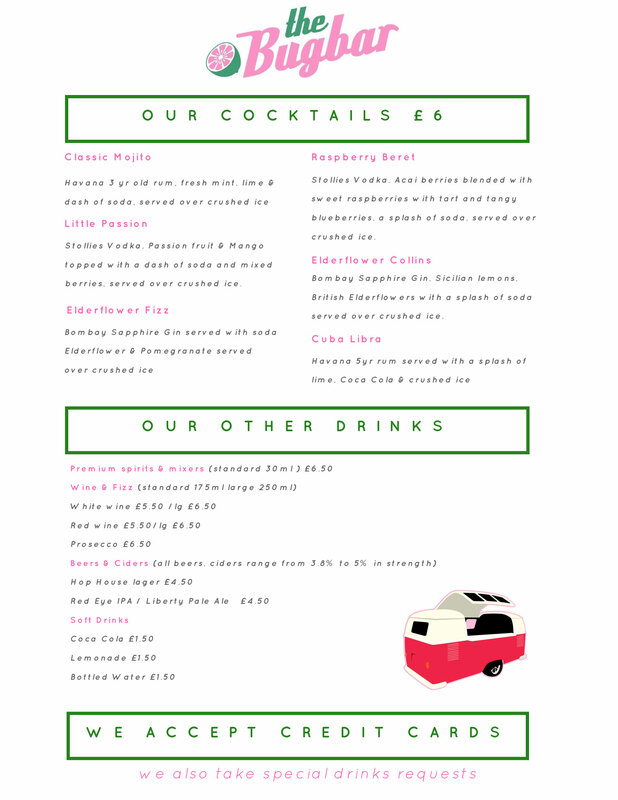 Please find our example bar menu below.